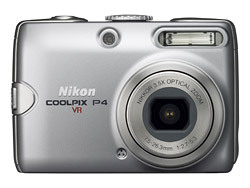 Nikon Coolpix P4 is the first compact digital camera to include Vibration reduction or stabilization technology. Nikon Coolpix P4 features 8.1 megapixels and 1/1.80 inch CCD sensor, 2.5 inch LCD monitor, vibration reduction which enables users to use a shutter speeds three stops faster, 3.5x optical zoom, focus range of 0.3m to infinity, macro focus range of 4cm (wide) to infinity, ability to capture movie with sound, 23MB internal memory. The P4 digital camera weighs 170g. More features, specification and sample images can be found at Nikon Coolpix P4 official homepage (no longer available). ComputerAct!ve (link dead) reviews Nikon Coolpix P4 and concludes with rating of 3 out of 5 that if used purely as a fully automatic point-and-shoot, outdoors the Coolpix P4 delivers the goods and provides even exposure and realistic colors. It has to be said, however, that the two Vibration Reduction modes reduce but don’t fully eliminate the bugbear of image blur, particularly in interiors without flash. Nikon Coolpix P4 offers a dose of medication, but not a cure, for shaky hands and out-of-focus images. TrustedReviews reviews P4 and concludes with overall rating of 8 out of 10 that in the Coolpix P4 Nikon has produced an excellent all-rounder, a pocket compact camera with a wider than average zoom range, a useful selection of features and options, and superb image quality. It is rather expensive compared to its immediate competition, but the extra money buys the quality and reliability that go with the Nikon brand. If you are looking for something a little more than the average snapshot camera it is well worth a look.